CLASSICALLY SPEAKING offers an approach for actors who wish to explore sound beyond their habitual speech, fine-tune their ability to hear and identify subtle variations in sounds and dialects, and to develop the flexibility and skills necessary to adjust their speech to the particular demands of a wider range of characters and material. These audio files are subject to United States and international copyright laws. Accordingly, it is illegal to transmit these files to anyone else, by any means, electronic, mechanical, recording, or otherwise, without written permission from the copyright holder, Patricia Fletcher. Introduction, IPA, Rhythm Highlighters (90 pages) The book begins with 45 pages of IPA study and focuses on general rhythmic issues for well-spoken American English, before delving into the specific spoken sounds of Neutral American Speech (NAS) in detail. 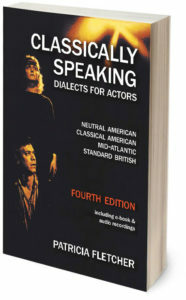 Neutral American Speech (NAS) (237 pages) is the most practical dialect an actor can study. Sometimes referred to as General American, it is spoken without regionalisms that identify an actor’s specific point of origin or ‘home’ sounds. When effectively incorporated, the actor – and therefore the character – is not revealed as explicitly Southern, Mid-Western, or from Boston, New York, Chicago, Tennessee, New Hampshire, Texas, etc. He/she is therefore ‘neutral’. Classical American dialect (89 pages) offers an intermediate option between well-pronounced Neutral American and Standard British. It builds upon Neutral American, blending additional rhythmic and sound elements, which result in more formal or heightened speech without sounding British to an American ear. Mid-Atlantic dialect (18 pages), which often sounds like Standard British to the untrained ear, is covered in brief, as is its relationship to Classical American and Standard British. Standard British (RP) (63 pages), the dialect traditionally spoken by the English upper and upper-middle classes, is appropriate for characters in period plays, those of the 19th century authored by Shaw and Wilde, or Restoration playwrights Congreve and Farquhar, among others. Note: It is also beneficial for American actors to know Standard British as a foundation on which to build their study of foreign accents. Speakers of Standard British have taught English as a second language to many people worldwide, and this is reflected in these people’s spoken English sounds.